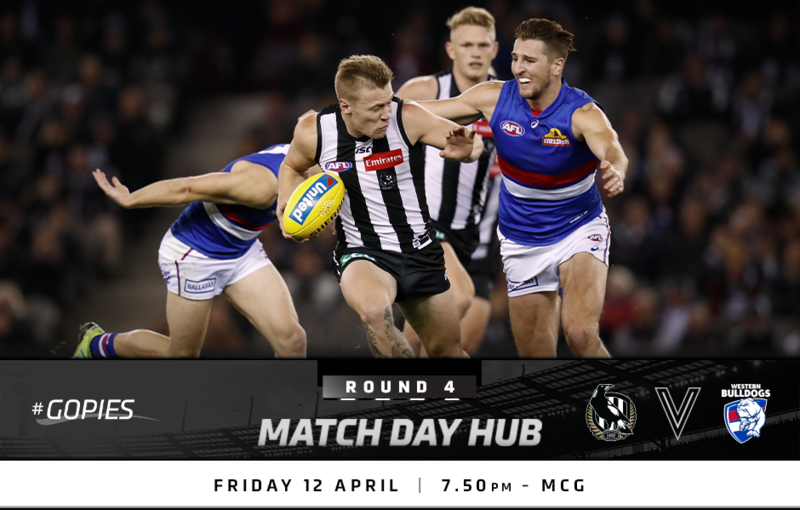 Come and see Collingwood take on the Western Bulldogs on Friday night under lights at the MCG. We are proud to work alongside our community partner, Robert Rose Foundation, who will launch their ‘Team 22’ Initiative at the MCG on Friday night. The foundation is named after former Magpie Robert Rose, who became a quadriplegic in a car accident at age 22. There are a number of ways to donate to this foundation which you can find out about on the big screen at the game. Click here to donate online now and to find out more about Team 22. The foundation aims to raise $500,000 from the initiative to continue and increase its support, which extends to equipment and house/car modifications, one-on-one mental health care and participation opportunities. Purchase your general admission ticket through Ticketek prior to the game this Friday night and you’ll get 2 general admission tickets for the price of one. Tickets are still available for the Friday night clash. Click here to upgrade to a reserved seat or buy your tickets to the game. Knock off early and watch Collingwood’s VFL team line up against Footscray at the Holden Centre. Come down to the Glasshouse at the Holden Centre from 4pm where hot food and beverages will be available for purchase. Social Club members will receive a $5 food and beverage voucher upon entry. Plus, the 2010 Premiership Cup will be on-site and it’s the perfect opportunity for you to get a photo and catch the VFL in action! Unleash your Passion in 2019 as an official Collingwood member. Visit membership.collingwoodfc.com.au or call 1300 MAGPIE (62 47 43) and join today. For all membership related enquiries, come down to our membership hub or marquee and visit the team. Collingwood members who purchased a membership prior to January 31 2019 can come and collect their cap from the following locations. Visit the Collingwood shop ahead of the Friday night clash against the Bulldogs. With 2019 stock available, it’s a great opportunity to get your new kit. Members can redeem their 10% discount on all full price purchases in store and online. Car parking spaces in Yarra Park will be very limited and in high demand. We strongly encourage fans to take public transport, or to park in the CBD if driving to the match. Click here to plan your trip to the MCG using Melbourne's public transport network. Please note, rail and road construction projects may impact some public transport services. Visit the PTV website linked above to find out how your journey may be affected. Due to major upgrades to Melbourne’s metro rail system, from Monday 1 April until Tuesday 23 April there will be disruptions across multiple lines which will affect your commute to this weekend’s game. Click here for info on affected train lines and alternate routes. There are many pedestrian and cyclist disruptions in the Melbourne Olympic Park Precinct as a result of the works. Please refer to the list below for specific crossings and footpaths that have been closed and alternative routes available. Closed the pedestrian footpath along Olympic Boulevard at Gosch’s Paddock to build a shared user path. Closed both pedestrian crossings at the Punt Road and Swan Street intersection. For the latest news on disruptions to transport networks in Melbourne, please click here to visit Victoria’s Big Build website. The MCG Footbridge will be partially closed to allow construction works to take place. There are alternative pathways available to the public. These include the use of William Barak Bridge and Edwin Flack Bridge for pedestrians and low mobility patrons to travel north to south across the precinct. Arrive early: Security measures such as wanding and bag checks will have an impact on the time taken to admit patrons to enter the stadium. Please allow extra time and don't leave your arrival until the last minute. Be patient: Security inspections take time, so please understand it will take a little longer to move people into the stadium. Limit the number of bags you bring: Each bag will be inspected, so the more you bring the longer it will take. Follow Collingwood’s official social media channels for all the latest news and behind-the-scenes action on game day. Join the conversation with the official hashtag #AFLPiesDogs. Download the Official Collingwood App for LIVE scores and stats of every game. Thanks to Melbourne Airport Parking, all Collingwood fans travelling from interstate to watch the game can enjoy 5% off* all Melbourne Airport parking when you book online at melbourneairport.com.au using promo code PIES2019. *Discount and promo code is valid for the official AFL 2019 home and away season and the finals series. Excludes Business car park. Minimum 24 hour required stay. Subject to availability. Melbourne Airport parking T&C’s apply.